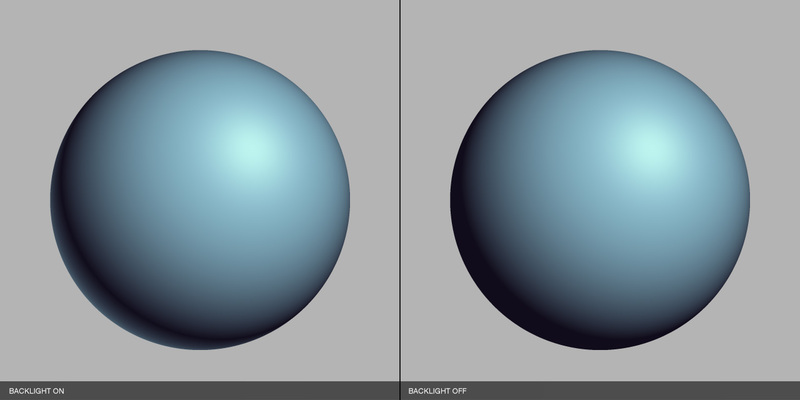 This Photoshop plugin generates 3D spheres. 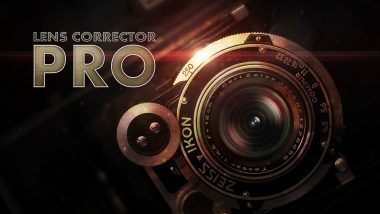 3D Sphere PRO is a versatile plugin for Adobe Photoshop that generates 3D spheres. 3D Sphere PRO boasts a feature-rich tool set including texture mapping, procedural mapping, light position & intensity, specular lighting, transparency and much, much more. 3D Sphere PRO provides artists with the capability to generate fully texture mapped spheres quickly and easily without any prior 3D software experience. 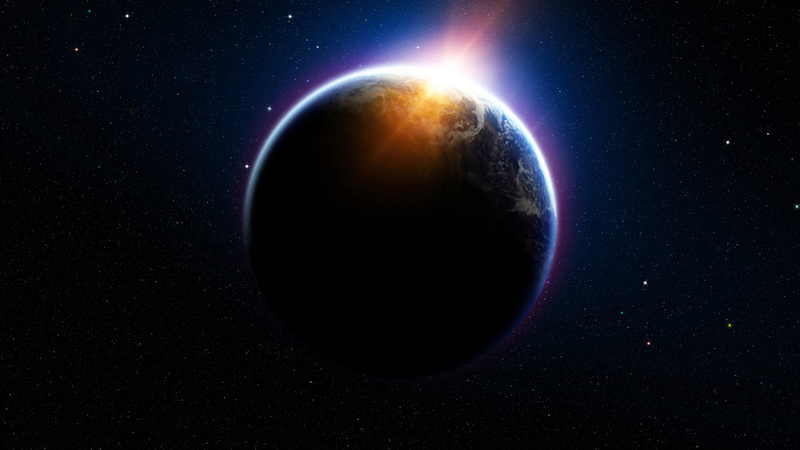 The spheres can be customized in virtually every possible way and rendered using blazing-fast algorithms that can generate a 2K sphere in under a second. Texture mapping is easily applied with a simple click of a button and light position can be interactively set by clicking directly in the viewport. 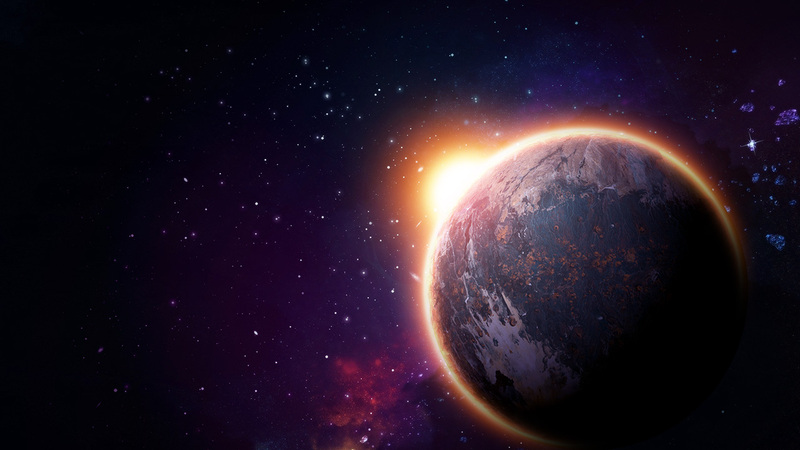 3D Sphere PRO comes with a preset of 40 procedural maps that can be customized on-the-fly. Adjust the placement of your texture with powerful UV tools including scale, offset, rotation, tile and flip. Control the sphere’s glossiness using specularity size and intensity, tint your sphere for accurate compositional integration or adjust the ambient lighting to match your composite’s gamma. 3D Sphere PRO provides a host of transparency controls allowing the artist to use an image or procedural texture to control the sphere’s transparency. 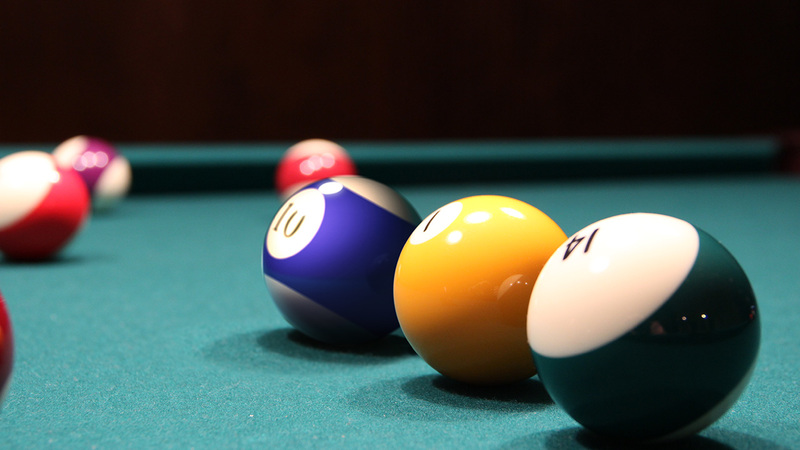 All these tools can be used in combination with one another to yield limitless creative results. 3D Sphere PRO is 100% multi-threaded capable of using an unlimited number of cores for ultimate speed. This is where you define all the geometric properties of the sphere. Radius: Controls the radius (in percentage) of the sphere. The default radius during startup is set to the minimum horizontal or vertical screen resolution – whichever is smaller. 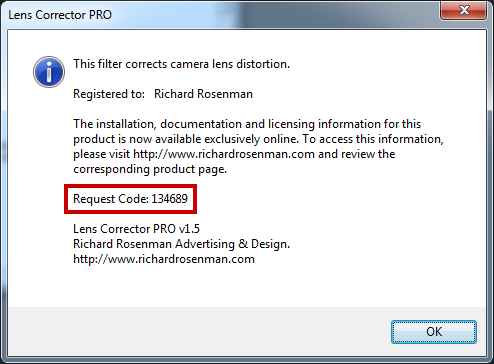 For example, if your workspace is 1280×720, the default sphere radius of 50% will equal 604 pixels. Radius increases will slow down rendering while radius decreases will speed it up. Axis X: Controls (in percentage) the horizontal placement of the sphere. This means that -100% will place the sphere’s center at the left hand side of the screen (pixel 0) while +100% will place it at the right side (pixel MAX-X-Res). Axis Y: Controls (in percentage) the vertical placement of the sphere. This means that -100% will place the sphere’s center at the top side of the screen (pixel 0) while +100% will place it at the bottom side (pixel MAX-Y-Res). Ellipse: Controls the horizontal and vertical elliptical properties of the sphere. Increasing this variable will stretch the sphere horizontally while decreasing it will stretch the sphere vertically. Cone/Flat: Controls the cone and flat properties of the sphere. Increasing this variable will produce flattened, button-like spheres while decreasing it will produce sharp, pointed spheres, much like a cone. Reset: Resets all ‘Sphere Properties’ controls to default. This is where you define all the rendering properties of the sphere. Diffuse A: Defines the diffuse color of the sphere. This is by default the color of the sphere. Diffuse (Swap): Swaps diffuse color A with diffuse color B.
Diffuse B: Defines the alternate diffuse color of the sphere. This is the secondary diffuse color which is often combined with Diffuse A for most procedural texture maps. Both diffuse colors can be used together for any number of effects, from simple gradients to complex procedural textures. Mapping: This specifies which procedural texture map to use for texture mapping. 3D Sphere PRO currently supports 40 procedural textures and many more are slated for future releases. Map Int: This slider controls the intensity of the procedural texture map over diffuse color A. A value of 100 will display the procedural texture at 100% intensity thereby fully covering diffuse color A while a value of 0 will display the procedural texture at 0% thereby fully revealing diffuse color A.
Map Var: This slider controls various properties of each of the procedural texture maps. For example, it will control the number of tiles for gradients, the brightness of the background map, the size of checkers, the center of a two-color stripe, and so on. For other procedural textures which don’t require user input, it may be ineffective. It is encouraged to be played with but try to keep it at 0 when switching from one procedural texture to another as most maps are set to work best with this default setting. Map I: Inverts the texture map. Scale U: Scales the texture map horizontally (in the U). Increasing this variable will stretch the texture map horizontally up to twice as large while decreasing it will scale it down up to half as small. Scale V: Scales the texture map vertically (in the V). Increasing this variable will stretch the texture map vertically to twice as large while decreasing it will scale it down to half as small. Scale R: Resets Scale U and Scale V controllers. Offset U: Offsets (shifts) the texture map horizontally (in the U). Increasing this variable will offset the texture map horizontally to screen right while decreasing it will offset it to screen left. Offset V: Offsets (shifts) the texture map vertically (in the V). Increasing this variable will offset the texture map vertically to screen bottom while decreasing it will offset it to screen top. Offset R: Resets Offset U and Offset V controllers. Rotate UV: Rotates (in degrees) the texture map clockwise. Remember to use ‘Bicubic’ sampling for best results. Rotate R: Resets UV rotation controller. Tile (U/V): Tiles the texture map horizontally (in the U) and/or vertically (in the V). When scaling the UV’s smaller than full size, the areas outside of the texture map dimensions will revert to Diffuse Color A. If you want the texture map to tile (repeat) instead, simply check off ‘Tile’ for the U (horizontal) and/or V (vertical). Flip (U/V): Flips the texture map horizontally (in the U) and/or vertically (in the V). Sampling: Specifies what type of pixel sub-sampling to use. (Nearest Neighbor being fastest, Bicubic being best.) This variable is very important to understand as it greatly impacts your rendering speed. For more detailed information, please see the ‘WORKFLOW TIPS’ below. It is recommended that one use ‘Nearest Neighbor’ sampling for working, and switching to ‘Bicubic’ for final output. Spec Size: Controls the size of the specular hotspot. Lower values increase the size of the hotspot making the sphere look more glossy while higher values decrease the size of the hotspot making the sphere look shinier. Spec Int: Controls the intensity (in percentage) of the specular hotspot. Lower values decrease the intensity while higher values increase the intensity. Tint: Specifies a color to tint the sphere with. 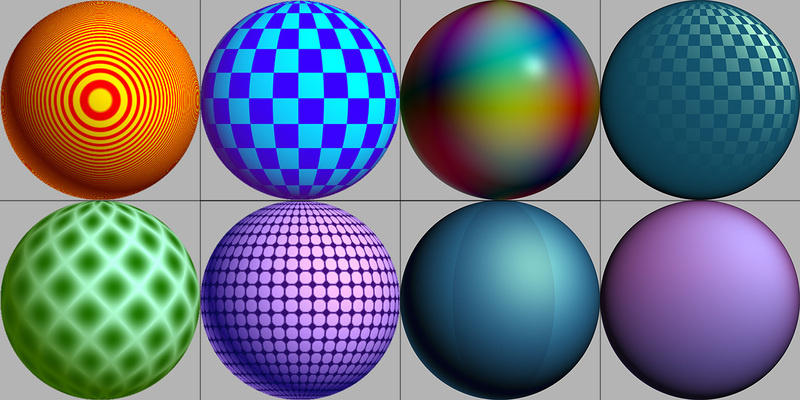 Tint colors are applied additively to the sphere. Tint (Swap): Swaps Add Tint color with ambient color. Ambient: Specifies the ambient color of the sphere. This is the part of the sphere that is not hit by any light and is by default shaded black. PI/2PI: The texture map will be mapped entirely on the front of the sphere, as opposed to front and back. For example, with this option enabled, the entire texture will be fitted and mapped onto the front of the sphere. If you could see the backside of the sphere, there would be no texture on it. With this option disabled, the left half of the texture will be fitted and mapped onto the front and the right half of the texture around the back. BG: If selected, the background will be replaced with either the BG Color (Use CL) or the texture map (Use MP). This option is by default enabled as it is easier to see your texture mapped sphere against a solid color instead of the background image. BG Color: This specifies what color to replace the background with. The default color is a neutral gray: RGB(180,180,180). Use CL: This specifies to use the BG color to replace the background with. Use MP: This specifies to use the texture map (from the mapping dropdown) to replace the background with. This is an especially useful option because it enables you to display the texture map in the background that will be mapped onto your sphere. Any UV transformations such as SCALE, OFFSET, TILE, FLIP, ROTATE as well as sphere positional transformations such as AXIS X, AXIS Y and ELLIPSE will be reflected in the texture map. Sphere: When this is deselected, the sphere will not be rendered. This is useful for generating only the texture maps for use in other programs. Reset: Resets all ‘Rendering Properties’ controls to default. This is where you define all the transparency properties of the sphere. It is worthwhile to discuss the Force Diff to CL (Force diffuse to color) and Force Diff to BG (force diffuse to background) options. 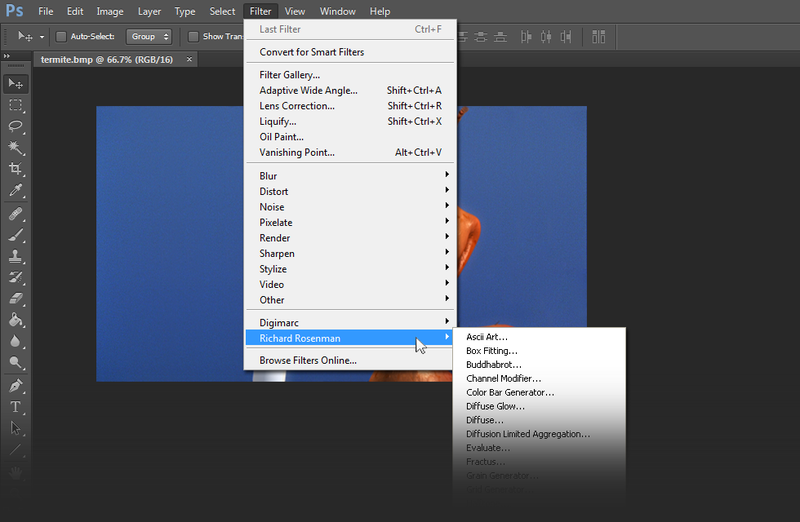 You may be wondering why these are here if you already have the option to use Diffuse A, Diffuse B or ‘Background’ from the mapping dropdown menu. The reason is because if you choose to use a procedural texture map for transparency, this will also make your sphere use the same map for texturing and this may not always be desirable. For instance, let’s assume you wish to use the Checkers texture as a transparency map. You would set the mapping dropdown to Checkers, set Diffuse B color to black in the Rendering Properties section and select the Transp to Use MP in the Transparency section. This would render your sphere as expected: with black checkers being completely transparent parts of the sphere and white checkers being completely opaque parts of the sphere. However, your texture map would also be set to Checkers. What if you wanted to use a color or a background for the texture map? This is exactly when you would select Force Diff to CL (force it to use Diffuse Color C) or Force Diff to BG (force it to use the background). 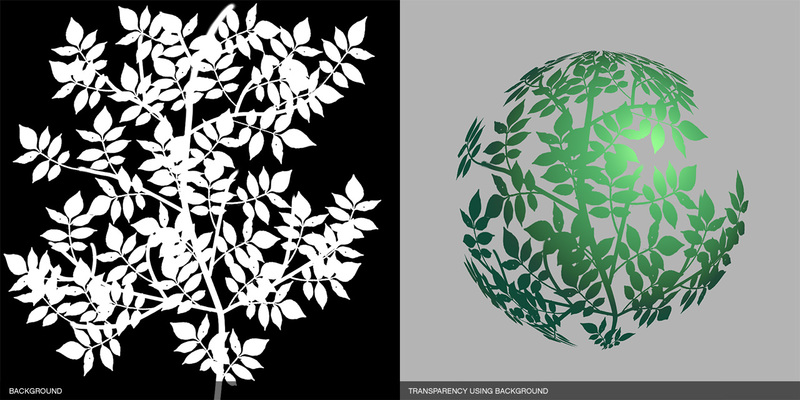 Both transparency and texturing can be used independently of one another or together. They are both extremely powerful options which allow you to customize your sphere in any manner you can possibly imagine. Transp Color: Specifies the transparency color. (White is fully opaque, Black fully transparent). Use CL: Specifies to use the transparency color for transparency. Use BG: Specifies to use the background map for transparency. Use MP: Specifies to use the currently selected procedural texture map for transparency. Gray: Converts any transparency maps to grayscale for luminance-based transparency mapping. If this is disabled, color will be factored into the transparency algorithm. Invert: Inverts the transparency map. Diffuse C: Defines the third, alternate diffuse color of the sphere. 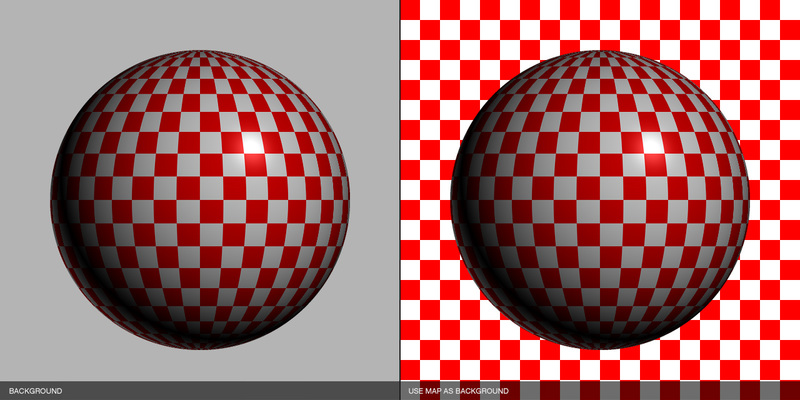 Force Diff to CL: Forces the sphere to use diffuse color C.
Force Diff to BG: Forces the sphere to use the background for texture mapping. Invert: Inverts diffuse color C or background texture map respectively. Reset: Resets all transparency controls to default. This is where you define all the lighting properties affecting the sphere. Light X: Specifies the horizontal location (in the X) of the light source. Light Y: Specifies the vertical location (in the Y) of the light source. Light Z: Specifies the depth location (in the Z) of the light source. Intensity: Controls the intensity (brightness) of the light source. Color: Specifies the light color (which directly affects specularity). Use BG: Forces the specular highlight to take the background into effect. This means that the background texture map will act as a mask and cause brighter parts of the texture to reveal more of the highlight while darker parts of the texture reveal less of the highlight. Use MP: Forces the specular highlight to take the procedural map into effect. This means that the procedural map will act as a mask and cause brighter parts of the texture to reveal more of the highlight while darker parts of the texture reveal less of the highlight. Backlight: When selected, a light directly opposite the light source will be enabled. Reset: Resets all light properties controls to default. Statistics: Prints the total (and estimated) rendering time elapsed for generating the preview and full size image respectively. Clicking in preview window: Sets the light source X & Y positions. LOAD/SAVE: Load and Save settings. OK/CANCEL: Apply or cancel the filter respectively. 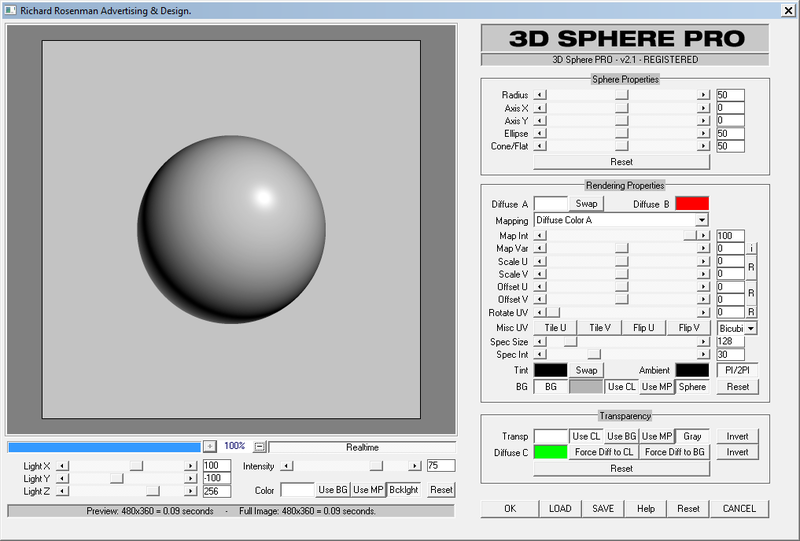 3D Sphere PRO has been optimized for quality. As a result, it is important to understand the basic functioning of the software in order to know how to get the most out of it. It is important to understand sampling in the Rendering Properties section. Sampling defines what type of interpolation to use for any and all pixel transformation routines (texture mapping, scaling, rotation, etc.). To understand this better, try the following test. Set the sampling to Nearest Neighbor. Set the procedural texture map to grid and reduce Map Var to less than -80 so you can see the grid lines. Notice how jagged and pixelated the mapped grid lines are on the sphere. Now switch your sampling to Bicubic. Notice how much cleaner the grid lines become. 3D Sphere PRO ships with Bicubic sampling on by default. This type of sampling provides the best quality output, but at a moderate speed sacrifice. By switching to Nearest Neighbor, you can gain a substantial speed increase, but at a moderate quality sacrifice. It is therefore recommended that one use Nearest Neighbor sampling for working, and switch to Bicubic for final output. Should you require additional speed and/or faster previews, try unselecting the realtime pushbutton. This will now update the preview window when you release the mouse button, instead of during the slider adjustment. Zooming down a level in the preview window will add dramatic speed increases. v1.1 – Fixed bug when applying filter resulting in a 200% speed increase. v2.0 – Almost entirely new code. Huge rewrite for better performance and more accurate results. v2.0 – Newly designed GUI for much larger preview window. v2.0 – True supersampling yields accurately antialiased edges. v2.0 – True specular shading.